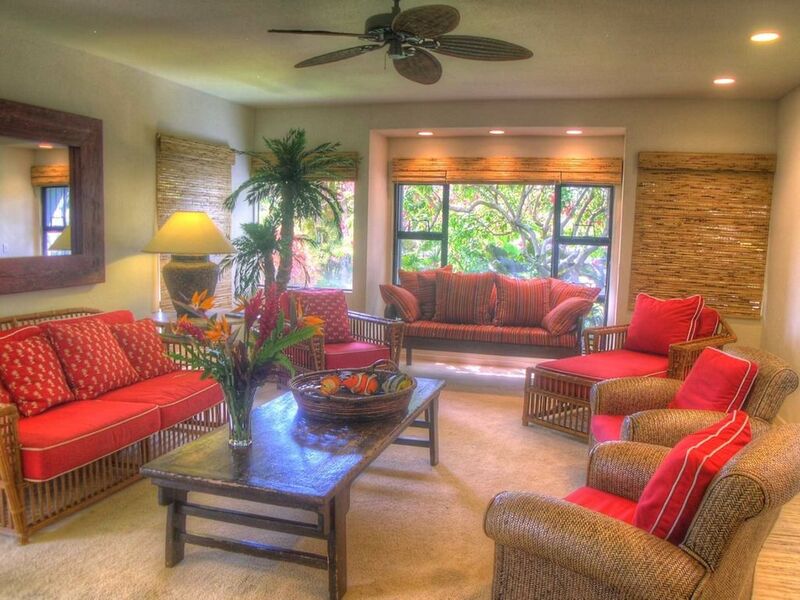 Hale Aloha in Poipu ~ Large 5 bedroom home with wonderful interior spaces, Free Fitness Club Membership. * Bring the extended family to celebrate the occasion. * Base rate is for 10 people, maximum 14. Please view "RATE NOTES"
Hale Aloha...welcomes you and your family and friends to a relaxed, comfortable, fully-equipped home base to enjoy and explore the beauty, activities and natural wonders of Kauai. Located in the Bayview addition of prestigious Poipu Kai Resort, Hale Aloha guests have use of the Poipu Kai pool and tennis courts (small court fee). This home is just a short stroll along the lush greenbelt to Poipu Beach Park, Brennecke Beach, and majestic Shipwreck Beach. The resort abuts the Grand Hyatt on the east, which features world class restaurants and the lovely Anara Spa. Tropical foliage surrounds Hale Aloha which is a beautifully appointed 3,800 sq. ft. home with traditional island Decor to enhance your stay in paradise. Relax and socialize in the many indoor and outdoor spaces, including: a large living room for conversing, movies, reading; family room with TV and X-box gaming; spacious upstairs den for board games, kid's play, etc. Enjoy the large patio off the dining room for a relaxing dip in the hot tub or sunbathing while being gently cooled by the Pacific trade breezes. The rich granite countertops and abundant natural light set the stage for enjoyable meal preparation. Up-to-date appliances, a full array of cookware, utensils and serving dishes will meet all your culinary needs. The dining room opens to the patio with ample seating inside and out for all. The back patio, shaded by the luscious foliage is a lovely spot for lounging and BBQing, plus a private hot tub spa for your enjoyment. The first floor master suite features a queen sized bed and full bath. The first floor guest bedroom features twin beds (they can be made into a king). The guest bath is just outside the door in the hall. The 2nd floor master suite features a king, four poster bed and full bath. The middle room upstairs has a lovely 4 poster king bed, with bath just down the hall. The second guest room upstairs features twin beds (once again they can be made into a king). Extra sleeping accommodations include a queen sleeper sofa in main floor family area and room for two single fold-out futon beds in upstairs den. To accommodate younger children we offer a play-n-pack for mom's convenience. We also have a rental link for additional baby needs. There is a large desk in the upstairs den to set up your temporary office. Turn on your laptop anywhere on the property and enjoy high-speed wireless internet access. Cable TV offers premium program viewing. Each room has its own TV. There are complete laundry facilities, i.e. washer and dryer, ironing board and iron in the laundry room. In the garage you will find the beach gear and a full sized ping-pong table. The home is on the floor level with just a small 4" step up into the main floor. The lower guest bath has handicapped bars. Our son-in-law declared the best part of our family vacation to be the house, Hale Aloha. It was so much more spacious, comfortable and convenient than we had expected. Even with fourteen of us we never felt crowded. There was ample room for us to all be in the living room or to spread out in different corners. We had easy access to beaches, the athletic club, shopping, restaurants and activities. Our grandson celebrated his 8th birthday snorkeling at Poipu Beach and at Luau Kalamaku! The athletic club had something for everyone from the pool to the cabana bar. We had some busy days ziplining, tubing down canals, driving to Waimea Canyon, taking helicopter tours, and taking a sunset cruise. It was always nice to get back "home" and relax. We felt very welcome and informed. Mahalo, Jim and Juliana! It is a beautiful house....lovely large rooms and good design of flow through the house. many extras, like beach chairs, cool boxes, and extra towels. We loved the hot tub, the table tennis and th croquet set. We would certainly hope to return here sometime in the future. We had a fantastic time in this beautiful home. Our family fit great, very spacious and room for all. It was a wonderful vacation! NIce big home for our large family! Property was very nice and well equipped to handle a large group of people. It was very quiet upstairs. Nicely decorated. Loved the location and the nice walk to the beach. The house was a terrific place for all if it's too have privacy and enjoy being together. The location is terrific for beach activities, hot tubing and pool time. Many other facilities close by as well. Lots of room in the house for everyone attend the dining room is great for crowds. Really enjoyed our time there. We had a 3 generation get-together in the house, and a wonderful stay on Kauai! The house is spacious and easily accomodated our group, giving everyone adequate space. The house does get a bit warm during the day, even with blinds closed, but cools down nicely at night with windows open and fans on. The house is well maintained and had everything we needed. The ping pong table was a lot of fun, and the hot tub was wonderful in the evening. We loved being so close to Poipu and Shipwreck beaches! We thoroughly enjoyed our stay! Great Poipu location. Poipu Kai, beside The Grand Hyatt Resort and the Anara Spa. Enjoy entertainment, shopping and dinning just a minutes walk away. Walk the green belt through the resort and arrive at some of the best beaches on the island (i.e. Shipwrecks, Poipu Beach, Brennekes)! Overlooks the famous Golf Course! As apart of Poipu Kai, enjoy pools, hot tubs, and tennis courts.